In an ongoing series of articles, critic and broadcaster Cristín Leach selects 21 artworks for RTÉ Culture that define Modern Ireland. In 2012, for the first time, works by basket-maker Joe Hogan were included in Ireland’s largest open submission art exhibition, the Royal Hibernian Academy annual show. It was a significant moment of shift in public perception of a movement among some of Ireland’s top traditional and artisan makers to blur the lines between art and craft. Primal Energy No.2 was Hogan’s contribution to the RHA Annual in 2016. A sculptural basket, intended for display rather than use, it is made from woven willow rods and a piece of ash wood, which sits at its centre like a gnarled fist. Primal Energy No.2 resembles a pumpkin or gourd, a solid, squat container, airy yet structurally sound; and it is remarkably large, measuring 57 x 78 x 63cm. Hogan has been working near Loch na Fooey in Galway since the late 1970s, making practical, functional baskets for everyday use. 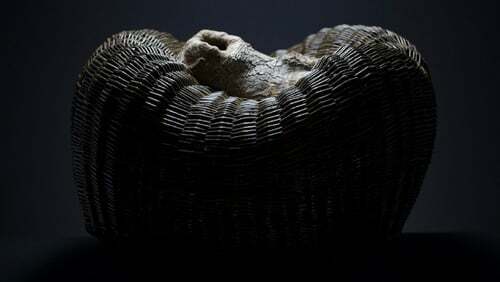 In recent years, he began showing and selling non-functional works, which he refers to as "artistic baskets". It is here that he is pushing the boundaries of traditional skills, experimenting with what is possible. These willow-woven pieces incorporate animal bones, bog wood, moss, lichen and elements like catkins, usually removed by traditional basket weavers. They marry the uniformity and repetition of the traditional weaving process with an organic approach to form. The perceived division between "art" and "craft" is a modern, Western hierarchy, not recognised in places like Japan where potters and carpenters are held in as high esteem as painters. Artists like Hogan demonstrate that the two are not mutually exclusive. Clear cut definitions of craft as producing practical objects and fine art as resulting in works that are non-functional are restrictive and not particularly useful when it can also be argued that both serve a purpose and, when pursued to a high standard, can result in outstanding objects of enduring cultural and artistic significance. Hogan’s artistic baskets have a remarkable physical presence. They are connected materially, culturally and socially to the place they come from, and to human history. They are objects grown and made from the land. The most arresting of them look like freshly-made archaeological finds. His work is in collections including that of Limerick City Art Gallery and the Office of Public Works, the Ulster Museum in Belfast, Boston College in the USA and the Collection of the Government of India. His baskets have been shown all over the world. In 2010, the Glucksman Gallery in Cork held a show called Forty Shades of Green, a Convergence of Irish Art and Craft. It included one of Hogan's woven willow baskets feathered with catkins and demonstrated clearly that he is not alone. His peer group in Ireland includes the ceramicist Sonja Landweer, whose work was given an impressive retrospective at Visual Centre for Contemporary Art In Carlow in 2010; the jewellery maker Angela O’Kelly and the leather worker Una Burke, whose wearable works cross the line between fashion items and art objects; and the furniture-maker Joseph Walsh whose Magnus Modus sculpture is now a centrepiece in the new courtyard of the refurbished National Gallery of Ireland. Artists like these have been busy reclaiming the word craft, some as part of a backlash against the prioritising of concept and theory over practical skills when it comes to making fine art. What is interesting however, is that they are simultaneously demonstrating that it does not have to be a competition. The Oliver Sears Gallery in Dublin has been pioneering in showing work by craft and fine artists side by side, and in giving artists working in traditionally craft-based mediums, such as Walsh, solo exhibitions. Hogan’s work demonstrates that traditional craft skills do not have to have a necessarily practical end. He is also offering a modern take on ancient traditions, nurturing and expanding the potential of ancient craft skills, to ensure they do not remain stuck in repetition. There is real artistic innovation here. Various terms have been applied to this kind of output: "fine art led craft", "fine craft", "fine art craft". Hogan’s work has been referred to as "basketry for basketry’s sake". We can also just call it art.